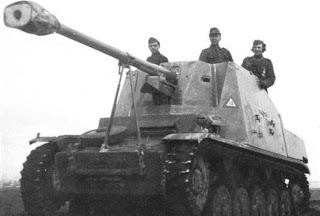 PzKpfw II Flamm Ausf A /B "Flamingo"
15cm sIG33 auf Fahrgestell PzKpfw II "Bison II"
7.5cm PaK40/2 auf Fahrgestell PzKpfw II (Sf) "Marder II"
Leichte Feldhaubitze 18/2 auf Fahrgestell PzKpfw II (Sf) "Wespe"
Notes: These rules are for the various models of the German PzKpfw II. Be sure to pick up the core Battleground WWII rules so that you can benefit from these legendary rules. 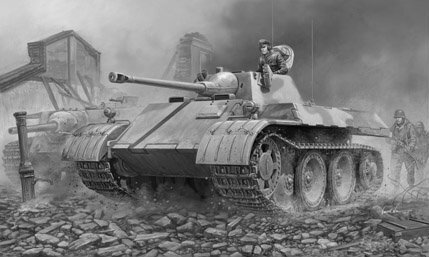 Vehicle Chart: We use the PzKpfw II Ausf F and Wespe vehicle charts from the Tanker's Challenge supplement and just modify when needed. 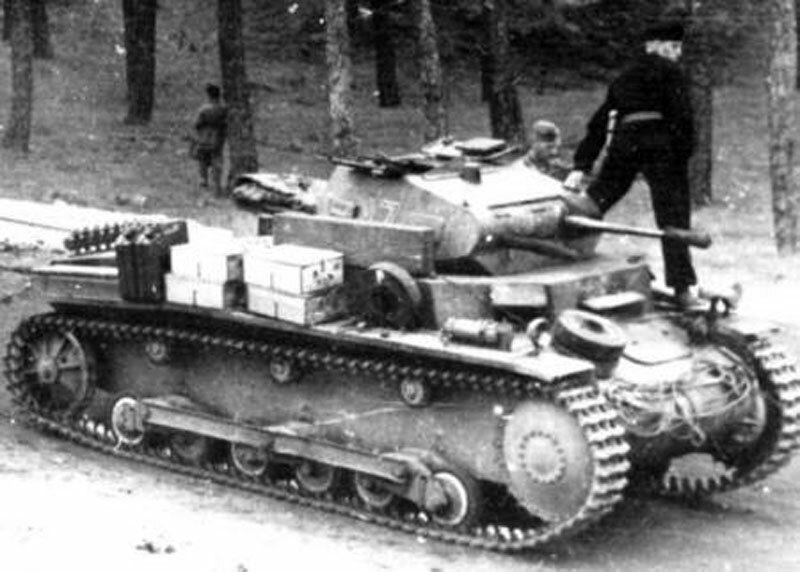 Crew: All the PzKpfw II models have a crew of 3 (commander/gunner, loader/radio op. & driver) unless noted otherwise. The Luchs and Leopard have a crew of 4 (commander/loader, gunner, radio op. 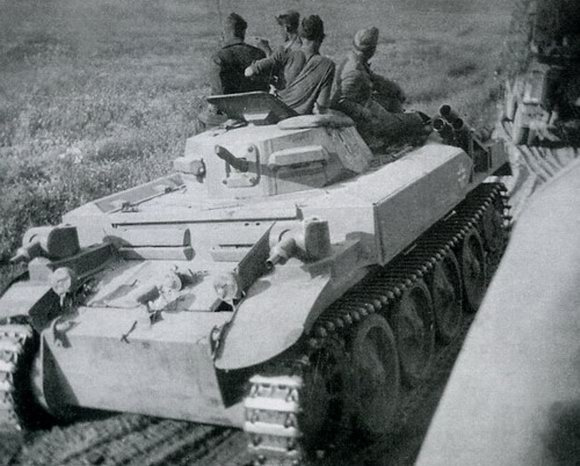 & driver) and all the SPG models, except the Marder II, have a crew of 4 (commander, gunner, loader/radio op. & driver). 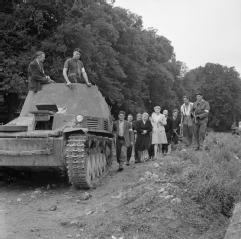 The Brukenleger Ausf B model and ohne Aufbau has a crew of 2 (commander & driver). 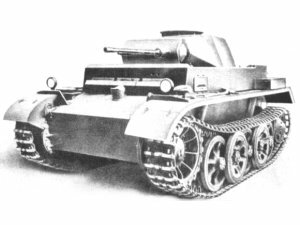 Commander as Gunner: The vehicle commander acts as gunner in all models of the PzKpfw II unless otherwise noted. Due to the vehicle's main weapons being machine guns and auto-cannons, the commander will never suffer from the No Commander penalty when firing the vehicle's weapons. Poor Cross-Country Mobility: All Ausf D/E models will suffer an additional +1 to all Bog Checks when on rough ground. 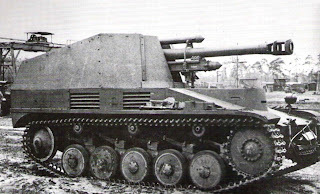 Smoke Dischargers: Some PzKpfw III models have two sets of dual smoke launchers fixed to either side of the hull rear loaded with smoke rounds. 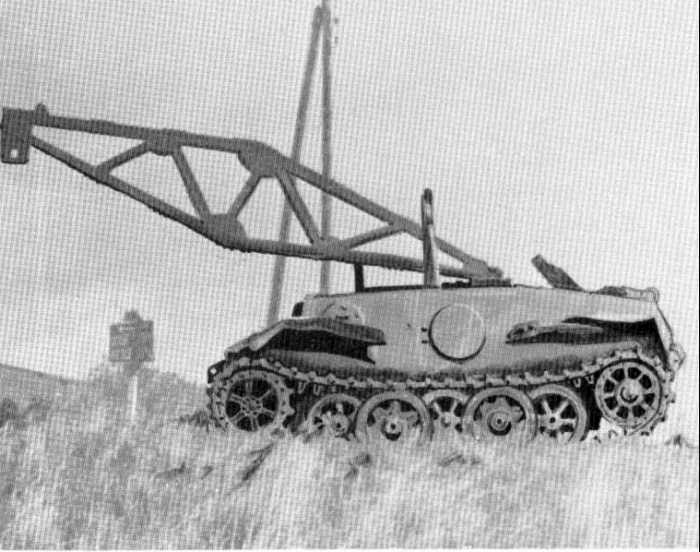 The commander uses an action to fire the launchers in which both will fire a single smoke round that will then smoke the front 180-degrees of the turret's front. The launchers can only be reloaded externally and it will take a crewman one action to load a single launcher. If only one set is loaded and then fired, it will only produce a 90-degree smoke cloud to the front side of whatever launcher was fired. Availability is as stated on the vehicle charts below. Early Leopard Smoke Grenade Launchers: Leopards use a pair of three-tube, smoke grenade launchers fitted to either side of the turret. The commander uses an action to fire the launcher in which all six tubes fire a single smoke grenade that will then smoke the front 180-degrees of the turret's front. 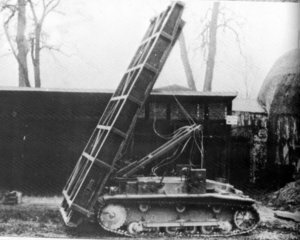 The smoke launcher can only be reloaded externally and it takes a crewman two actions to do so for each of the two launchers. If only one launcher is loaded and then fires, it will only produce a 90-degree smoke cloud to the front side of whatever launcher was fired. This smoke discharger was replaced with the Nahverteidigungswaffe launcher in late production models and retrofitted to many of the early production turrets as well. Availability is 15. Leopard Nahverteidigungswaffe: Late production Leopards are fitted with a launcher in its turret that is capable of firing small shells from within the safety of the turret. 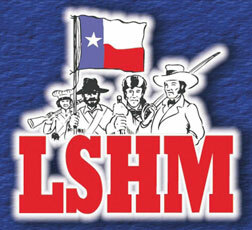 The launcher has a 360-degree field of fire and is capable of firing fragmentation, smoke or flare shells. 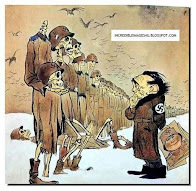 It will cost the loader one action to load and another to fire the Nahverteidigungswaffe. 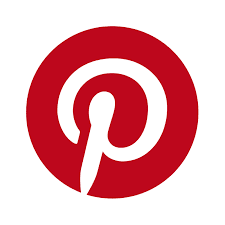 The launcher may be rotated 180-degrees and be fired in the same action it moved. Both the fragmentation and smoke shells produce a Medium-sized template when fired. The shell's template can be placed anywhere along a 360-degree arc, 2" away from the center of the vehicle. The crew must be Buttoned-Up when the Nahverteidigungswaffe fires a fragmentation shell. Note that if any turret crew are exposed, the weapon will not be used until they duck down into the turret or they Button-Up. This is due to the possibility of the round striking one of the crew while exposed. Use the WYSIWYG rule to determine its Availability. 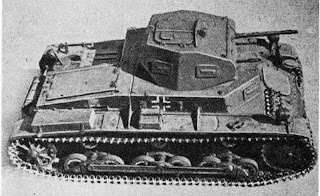 Flamingo Flammpanzer: The Flamingo is a PzKpfw Ausf D/E that has has been fitted with two fixed forward firing Flammenwerfer Anlagen flamethrowers on either side of the hull. The flamethrowers have enough fuel for 10 shots and will use the Vehicle-Mounted flamethrower template. The tip of the template will be placed 2" directly in front of the flamethrower's position. Any prone figures between the template and tank will make an immediate Morale Check and any standing will suffer an automatic Gory Death. All normal flamethrower rules apply. Any penetrating hits to the front 12 and 16 or left and right side 9 and 10 locations will cause an automatic Catastrophic result on the Penetration Effects chart due to the penetration of the flamethrower's fuel tank. 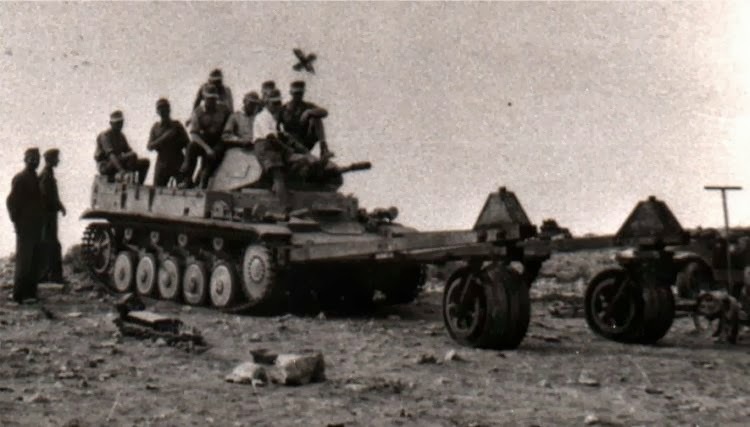 The weapon takes an action to fire by the tank's gunner. The Flamingo has its original turret replaced with a rudimentary turret fitted with a machine gun that is fired by the vehicle's commander. PzKpfw II Ausf H: The H model is fitted with a new turret that mounts the 5cm KwK 39 cannon. 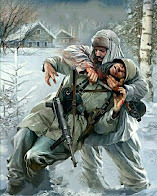 The commander serves as the loader for the weapon and cannot direct fire in the same action they load. 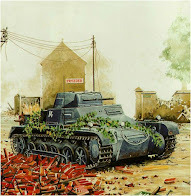 The KwK 39 fires HE, AP and APCR shells. The Availability for the APCR is a 10 with D6 rounds available. Bison II: The Bison II mounts a 150mm howitzer with a traverse 10-degreed before the vehicle will have to move to engage a target. The gun fires HE, smoke and a hollow charge shell. The crew will also receive cover to any enemy fire coming from the front of the vehicle due to the gun shield but it will not offer any protection from fire from the rear or from elevated positions. 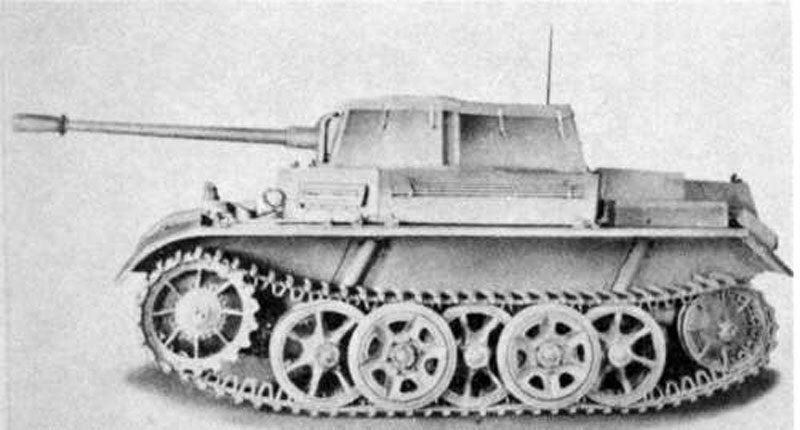 Leopard: The Leopard uses the same turret as the "Puma" heavy armored car and the chassis of the PzKpfw II. The commander serves as the loader for the weapon and cannot direct fire in the same action they load. 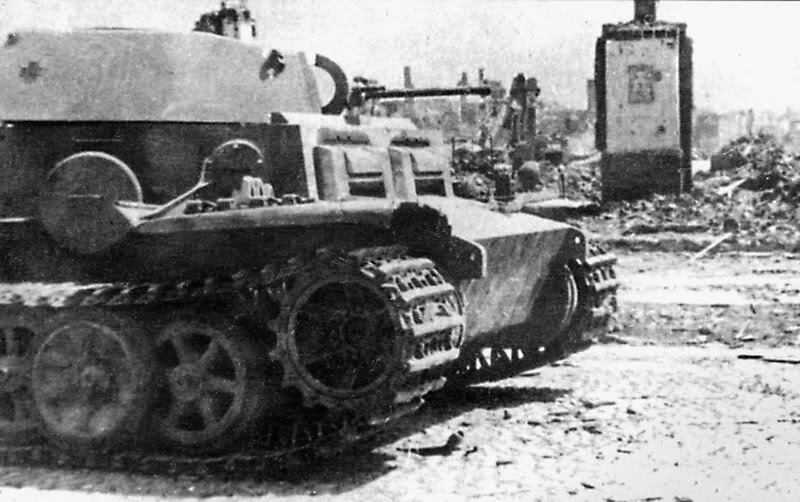 The KwK 39 fires HE, AP and APCR shells. The Availability for the APCR is a 10 with D6 rounds available. Ostketten/Winterketten: These are track extensions that produce a better ground pressure when in snowy or muddy terrain. These track extensions will give the vehicle a -1 bonus when making Bog Checks in any snow/ice or muddy terrain. Availability is a 10 for these track extensions. 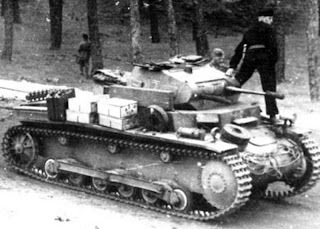 Panzer Selbstfahrlafette 1 fur 7.62cm PaK36(r) aud Fahrgestell PzKpfw II Ausf D: This SPG mounts the Russian 7.62cm P ober. 39 renamed the PaK36(r) on the Ausf D chassis. 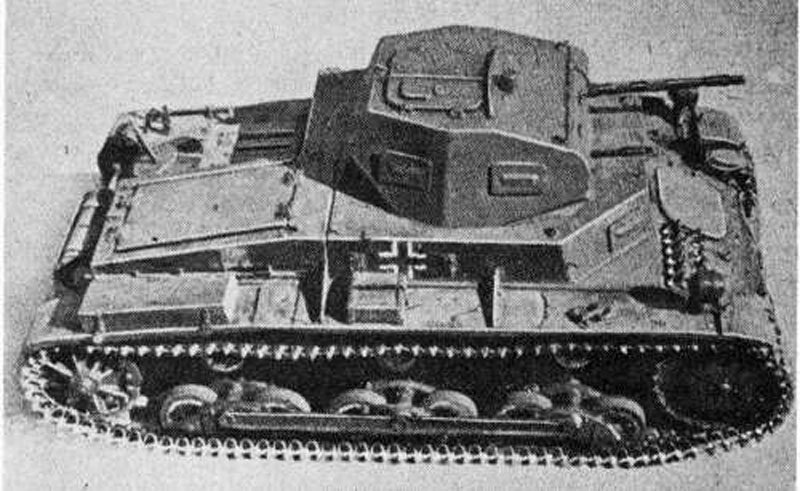 Although numerous guns were captured during the initial phase of Barbarossa, German units will only have HE and AP available for use. 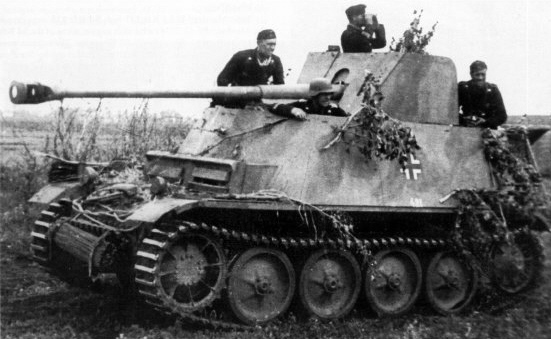 Marder II: The Marder II mounted the excellent PaK40 on the PzKpfw II. 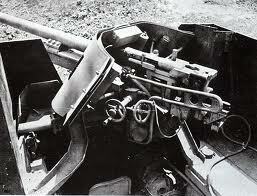 The PaK40 fired HE, AP and APCR shells. APCR Availability is a 5 with D6 shells available. Wespe: The Wespe mounts the 10.5cm leFH 18M on the PzKpfw II chassis. The howitzer fires both HE and AP shells. 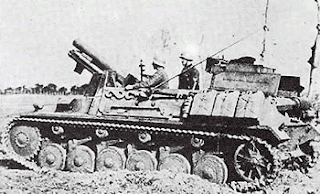 Munitions Wespe: This weapon is in essence a Wespe but without the 10.5cm leFH 18M howitzer installed. 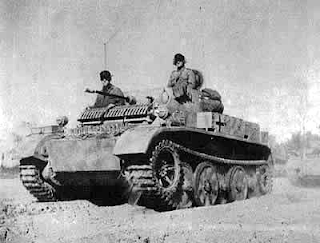 These vehicles were attached to Wespe units and used as ammunition carriers. 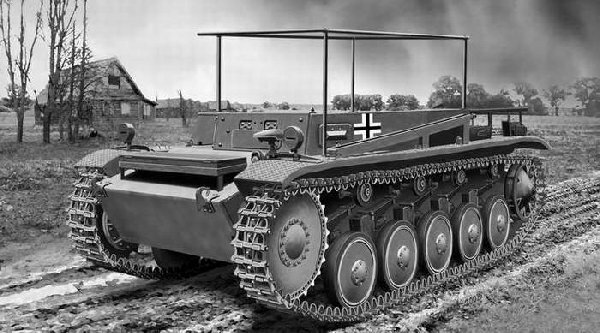 Brukenleger Models: The Ausf A model is fitted with a two-part sliding bridge that can be used as a ramp to scale steep inclines as well as a conventional bridge. It takes the crew two actions to extend the bridge before use. The bridge can hold up to 20 tons. The Ausf A's turret has been removed and its crew reduced to 2. The Ausf B model has a static bridge affixed to the hull used to scale inclines and is also fitted with a bridge that can be dismounted and used over expanses. It takes the crew two action to dismount the bridge. The static bridge can hold up to 20 tons where the dismounted bridge up to 12 tons. 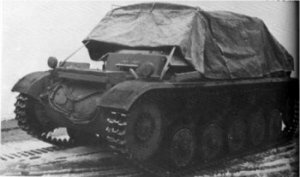 The Ausf B model still retains its turret but will only be able to rotate the turret 45-degrees due to the piers of the affixed bridge. 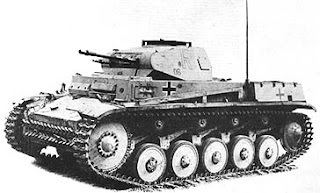 Bergepanzer II: The Bergepanzer II is a Ausf J model that has its turret removed and replaced with a jib. The vehicle is capable towing up to 20 tons and the jib can lift up to 5 tons. 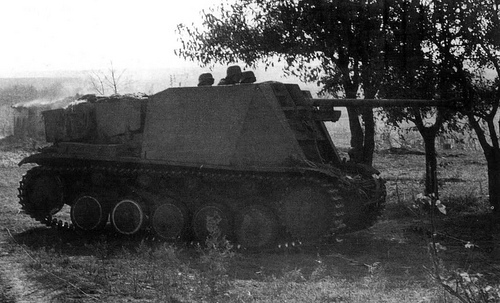 5cm PaK38 & PaK38 L/60 SPG: Both of these models were fitted with a 50mm cannon that fired AP, HE and APCR shells. APCR shells have an Availability of 5 with D6 rounds available. PzKpfw II mit Schwimmkkorper: For the anticipated invasion of England, a program to fit pontoons onto the PzKpfw II was initiated. The pontoons are fitted to either side of the hull and one on the bow. The vehicle is propelled by the vehicle's tracks and can move up to 1/4 of its normal movement per action within the water by the driver. 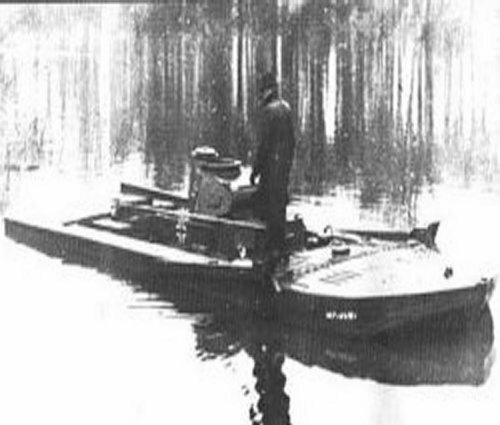 If the vehicle or pontoons are penetrated while in the water, the tank will be lost and the crew will be KIA unless they pass a 1/4 Skill Check to escape the drowning tank. All To Hit rolls to a swimming tank will be at a +1 due to its small size when in the water. The pontoons can be detached by the commander within the turret by spending 1 action to pull the quick release lever. 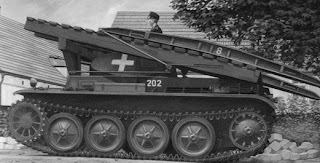 Once removed, it will take 5 man actions to move the pontoons out of the way of the tank or the tank can choose to just drive over them with a normal Bog Check. If the crew drives over a pontoon, it will automatically be destroyed. 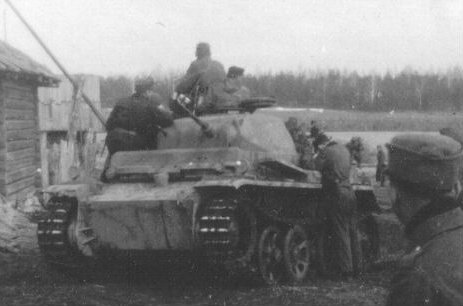 Once detached, it will take 40 man actions to reattach the pontoons to a stationary PzKpfw II. The pontoons will act the same a Schurzen when taking enemy fire on land. The vehicle will follow all amphibious vehicle rules as normal. Availability is 5. 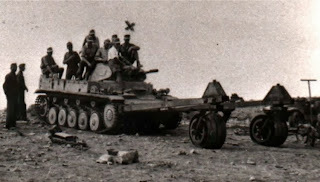 Mine Roller: In the North African campaign, several PzKpfw IIs were fitted with basic mine rollers designed in theature. The mine roller will automatically clear any anti-personnel mines but anti-tank mines can have a chance of destroying the roller when detonated. When clearing an AT minefield roll a D20 for every action spent clearing the minefield and consult the chart below to see if the exploder is destroyed by the detonation. If destroyed, the vehicle is immobilized for D20 actions while the crew detaches the exploder from the vehicle. 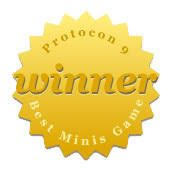 Note that when clearing any kind of minefield, the crew must be Buttoned-Up to do so and may only move up to a maximum of half their normal movement. Note that this mine roller was only ever deployed with the Afrika Corps in North Africa and the Availability is 8. 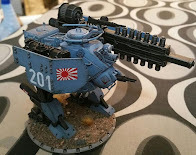 Wargaming Piece: Not sure of the PzKpw II stuff in 1/48 so just do some Google-Fu and see what ya find. **Varies on what model used.